After WWII, Japan aspired to become a full-fledged player in the international system principally conceived and run by the United States. The 1941 Roosevelt Four Freedoms Speech is reflected in the 1945 UN Charter as well as in the 1947 Japanese Constitution. Since than, Japan has pursued, and thrived in, this world order, enhancing and somewhat shifting its role. Seventy years hence, Japan adheres to the basic values of human rights, democracy, free economy and rule of law. Today when liberalism as the ultimate answer to solve global questions is under certain skepticism, the lecturer attempts to shed light on a way forward, by providing an observation based on encounters through her diplomatic career in the UN arena. Ms Misako Kaji graduated from the University of Tokyo (BA in Economics) and joined the Ministry of Foreign Affairs of Japan in 1981. She then studied at Oxford University (MA in Philosophy, Politics and Economics), followed by serving at the Japanese Embassies in the U.K. and in Vietnam, and the Japanese Missions to the EU and to the UN. 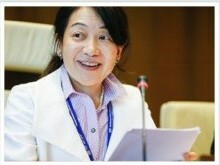 She also served as Special Advisor to United Nations High Commissioner for Refugees (UNHCR), Deputy Press Secretary to the Prime Minister of Japan, Professor at the Department of Advanced Social & International Studies of the University of Tokyo, Ambassador and Deputy Permanent Representative to the International Organisations in Geneva, and Senior Research Fellow at the Institute for International Policy Studies. She is Professor of International Relations at Hitotsubashi University since April 2017.